We are delighted to welcome you at the ‘12th International Conference on Environmental Toxicology and Ecological Risk Assessment’ on “Multidisciplinary Approaches to Solve Environmental Toxicity Risks” by ConferenceSeries Ltd to be held on October 19-20, 2017 Atlanta, Georgia, USA. Environmental Toxicology is highly interdisciplinary fields encompassing several fields like Environmental Biochemistry, physiology, ecology, microbiology, molecular genetics, genomics etc., Main analyses are made by conducting several lab works and field environment i.e., exposure and risk assessment. The Conference embraces several parameters of Environmental Toxicology Conference and Ecological Risk Assessment works. It depends upon factors such as modelling of fate and transport of toxicants. Environmental toxicology deals with the adverse effects of environmental toxicants on health and the environment. Environmental toxicants are agents released into the overall environment that can cause adverse effects on health. The word “health” here refers to not only social health but also the health of animals and plants. The study of environmental toxicology stems from the recognition that Human survival depends upon the well-being of other species and upon the availability of clean air, water and food and Anthropogenic chemicals as well as naturally occurring chemicals can have detrimental effects on existing organisms and ecological processes. Environmental toxicology is thus concerned with how environmental toxicants, through their contact with humans, animals, and plants, influence the health and welfare of these organisms. Occupational toxicology deals with the substances found in the workplace. The major emphasis of occupational toxicology is to recognize the agents of concern, identify the acute and chronic diseases that they cause, define the conditions under which they may be used carefully, and prevent absorption of harmful amounts of these chemicals. Occupational toxicologists may also describe and carry out programs for the surveillance of exposed workers and the environment in which they work. Regulatory parameters and voluntary guidelines have been elaborated to establish safe ambient air concentrations for many chemicals found in the workplace. Ecotoxicology is a mixture of ecology, toxicology, physiology, analytical chemistry, molecular biology, and mathematics. Ecotoxicology take a look at the impacts of contaminants including pesticides on individuals, populations, natural communities, and ecosystems. The social order of living things and the environments they live in form ecosystems. Ecosystems include ponds, rivers, deserts, grasslands, and jungles, and they too can be affected by pesticides. Eco toxicologists also study what happens to the pesticides themselves, where they move in the environment, how long they last, and how they completely break down. This fact sheet will focus on pesticides in ecotoxicology. With rising interest in the safety of foods, knowledge of food toxicology is gaining more importance every day. Introduction to Toxicology and Food delivers a concise overview of both the science of toxicology and food toxicology. It presents easy-to-understand explanations of the ideas and principles of toxicology as a science, the toxicants found in foods, and naturally occurring antitoxic/ant carcinogenic substances in foods. It examines the uses, harmful effects, and safety aspects of a wide range of toxicants, including natural toxicants, contaminants, and food additives. Medical Toxicology is a medical subspecialty concentrating on the diagnosis, management and prevention of poisoning and other bad health effects due to medications, occupational and environmental toxins, and biological agents. Medical Toxicology is officially known as a medical subspecialty by the American Board of Medical Specialties. Medical toxicologists are engaged in the comprehensive high level care of people and patients who come into contact with drugs, substances or other agents that pose a threat to their wellbeing. Global warming states about climate change, that causes an increase in the average temperature of the lower atmosphere. Global warming can have a different number of causes, but it is most commonly associated with human interference, specifically the release of large amounts of greenhouse gases. Greenhouse gases, such as carbon dioxide (CO2), methane (CH4), water vapour, and fluorinated gases, work like a greenhouse around the earth. This means that they let the heat from the Sun into the atmosphere, but do not permit the heat to escape back into space. The more greenhouse gases there are, the larger the fraction of heat that is trapped inside the earth’s atmosphere. The earth could not exist in its present state (that is, with life) without the presence of some naturally occurring greenhouse gases, such as CO2, CH4, and water vapour. Environmental science involves different areas of study. Most often, the study of environmental science includes the study of climate change, natural resources, energy, pollution, and environmental issues. In environmental sciences, ecologists study how plants and animals create network with each other, chemists study the living and non-living components of the environment, geologists study the creation, structure and history of earth, biologists study the biodiversity, Physicists are involved in thermodynamics, computer scientists are involved in technical innovations and computer modelling and biomedical specialists study the impact of environmental issues on our health and social lives. Environmental chemistry is the study of chemical methods occurring in the environment which are impacted by humankind's activities. These impacts may be seen on a local scale, through the presence of urban air pollutants or toxic materials arising from a chemical waste site, or on a global scale, through depletion of stratospheric ozone or global warming. The focus in our events is upon developing a fundamental understanding of the nature of these chemical processes, so that humankind's activities can be accurately evaluated. Chemical toxicity in water can be tested with aquatic animals as indicators. Toxicity tests with aquatic animals are primarily concerned with direct uptake from water. The chemicals may be in solution, in suspension or both. Aquatic organisms have played significant roles as early warning and monitoring systems for pollutant burdens in our environment. However, they have significant ability to do even more, just as they have in basic biology where preparations like the squid axon have been important tools in establishing physiological and biochemical mechanisms. Waste management is the precise name for the gathering, transportation, disposal or recycling and monitoring of waste. This term is given to the material, waste material that is produced through human being activity. This material is managed to avoid its harmful effect over human health and environment. Most of the time, waste is managed to get resources from it. The waste to be managed contains all forms of matter i.e. gaseous, liquid, solid and radioactive matter. The technique for the management of waste may differ for developed and developing nations. For urban and rural populations, industrial and residential zones it does differ as well. The management of waste in metropolitan and rural areas is general responsibility of the native government. While the waste that is produced by the industries is managed by the industry itself, in case it is non-hazardous. Ecological risk assessments deal with changes made by human that alter important features of ecological systems such as lakes, streams, forests, or watersheds. When we exert a new chemical (such as a pesticide to a wheat field), accidentally import a new species (such as a foreign insect), or change a landscape (such as draining or filling a wetland), scientists often assess how much harm those actions may have on the plants or animals in the area. Ecological risks may be local—a hazardous waste site. The threats may be regional—the Chesapeake Bay, the Black Forest, or the Great Barrier Reef. The risks may be worldwide—atmospheric transport of chemicals or global warming. Ecological risks may involve a specific type of plant or animal (a bass), a community of creatures (the fish in a lake), or an ecosystem (all of the biological and physical components of the lake). Health, Safety and Environment (HSE) is an umbrella term for the laws, rules, guidance and processes designed to care employees, the public and the environment from harm. In the workplace, the responsibilities for designing and implementing suitable procedures is often assigned to a specific department, often called the "HSE" department which is responsible for environmental safety, occupational health and safety at work. HSE management has two general goals: prevention of incidents or accidents that might result from abnormal operating conditions and reduction of harmful effects that result from normal operating conditions. ConferenceSeries Ltd Conferences invites all the participants from all over the world to attend ‘12th International Conference on Environmental Toxicology and Ecological Risk Assessment’ during October 19-20, 2017 Atlanta, Georgia, USA which includes prompt keynote presentations, Oral talks, Video presentation, Poster presentations and Exhibitions. Environmental Toxicology is highly interdisciplinary fields encompassing several fields like Environmental Biochemistry, physiology, ecology, microbiology, molecular genetics, genomics etc., Main analyses are made by conducting several lab works and field environment i.e., exposure and risk assessment. ConferenceSeries Ltd organizes a conference series of 1000+ Global Events inclusive of 300+ Conferences, 500+ Upcoming and Previous Symposiums and Workshops in USA, Europe & Asia with support from 1000 more scientific societies and publishes 700+ Open access journals which contains over 30000 eminent personalities, reputed scientists as editorial board members. Environmental Toxicology Conference 2017 Summit offers a unique window and opportunities to present and evidence the latest updates with a holistic approach to different areas of interest. We have done our utmost to get rid of the traditional “silo” approach in the elaboration of the program and most importantly, during the active sessions, in order to foster innovation and scientific curiosity. Thus, our intention is, to create platforms which will gather eminent scientists who will undoubtedly enrich our meeting during the Q&A sections. We have tried to compile a scientific program that we hope will be appealing to experienced, aspiring and young scientists. The organizers truly hope that your participation at the summit will encourage a creative networking atmosphere between Academia and Industry. If we are able to achieve this, even in a modest fashion, our expectations will be fulfilled. Summary: Environmental Toxicology 2017 welcomes attendees, presenters, and exhibitors from all over the world to Atlanta, Georgia, USA. We are delighted to invite you all to attend and register for the “12th International Conference on Environmental Toxicology and Ecological Risk Assessment (Environmental Toxicology 2017)” which is going to be held during October 19-20, 2017 at Atlanta, Georgia, USA. The organizing committee is gearing up for an exciting and informative conference program including plenary lectures, symposia, workshops on a variety of topics, poster presentations and various programs for participants from all over the world. We invite you to join us at the Environmental Toxicology-2017, where you will be sure to have a meaningful experience with scholars from around the world. All the members of Environmental Toxicology 2017 organizing committee look forward to meet you at Toronto, Canada. Environmental toxicology is a field of study in the environmental sciences that is concerned with the assessment of toxic substances in the environment. Although it is based on toxicology, environmental toxicology draws heavily on principles and techniques from other fields, including biochemistry, cell biology, developmental biology, and genetics. Among its primary interests are the assessment of toxic substances in the environment, the monitoring of environments for the presence of toxic substances, the effects of toxins on biotic and abiotic components of ecosystems, and the metabolism and biological and environmental fate of toxins. The scientific program of Environmental Toxicology encompasses a plenary session, symposia and workshops, panel discussions, informational sessions, regional sessions and poster sessions. Environmental Toxicology enhances opportunities for educational development and to exchange the knowledge in ecotoxicology and its applications. Atlanta is the capital of and the most populous city in the U.S. state of Georgia. And with a 2013 estimated population of 447,841. Atlanta is ninth largest metropolitan area in the United States. Atlanta is considered as a world city and with a gross domestic product of $270 billion. More than 30 colleges and universities located in the city, Atlanta is considered a center for higher education. Atlanta is also home to nationally renowned private colleges and universities. Atlanta's economy ranks 15th among world cities and sixth in the nation. The Atlanta metro has the fifth largest population in the U.S. with 5.7 million residents. It is considered to be a top business city and a primary transportation hub of the Southeastern U.S. The city contains the world headquarters of corporations such as Coca-Cola, Home Depot, UPS, Delta Air Lines and Turner Broadcasting. Although traditional Southern culture is part of Atlanta's cultural fabric, it's mostly the backdrop to one of the nation's leading international cities. This unique cultural combination reveals itself at the High Museum of Art, the bohemian shops of Little Five Points, and the multi-cultural dining choices found along Buford Highway. Atlanta also hosts a variety of history museums and attractions, including the Atlanta History Center and the Martin Luther King, Jr. National Historic Site. The city is also home to a number of post-secondary educational institutions including Clark Atlanta University, Georgia Institute of Technology, Georgia State University and others. There a large number of institutes and associations in USA dealing with the researches Environmental Toxicology, Analytical Toxicology, Environmental Biology and Public Health. Moreover, there have been many public knowledge transfer programs organized in USA, to improve self-efficacy in the prevention of environmental toxicity. These developments and their corresponding consequences have accompanied Atlanta in becoming a recognized world leader. Thus, Atlanta has been chosen to conduct the conference Environmental Toxicology-2017. 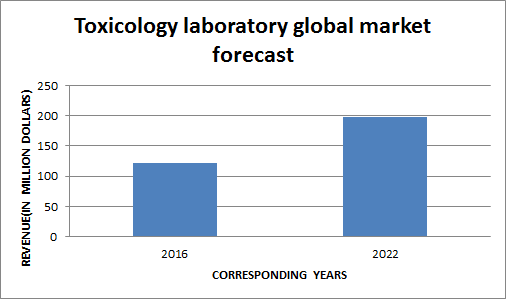 The North America Toxicology Laboratories market is expected to reach US$ 198.2 Mn by the end of 2022 at a CAGR of 11.1% during the forecast period. On the basis of drug class, the North America toxicology laboratories market is segmented into alcohol, amphetamines, barbiturates, benzodiazepines, opiates/opioids, tricyclic antidepressants, and Z-Drugs. Weak regulatory control on prescription drugs with regard to over-the-counter purchases has been resulting in increased substance abuse and for amphetamines in particular. This increased consumption is fuelling the demand for drug toxicology testing of amphetamines across the U.S. Amphetamines drug toxicity testing segment has been estimated to contribute highest in terms of revenue, accounting for 27.7% of the total toxicology laboratories market share in 2015. The opiate/opioids drug class segment has been estimated to be the fastest-growing segment of the North America toxicology laboratories market, registering a CAGR of 13.3% during the forecast period. 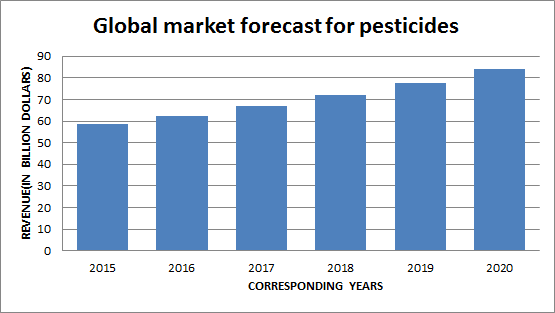 The global value market for pesticides stood at $58.46 billion in 2015 and is expected to register growth at a CAGR of 5.79% between 2015 and 2020. Pesticides constitute the largest category within the market for crop protection chemicals, with bio pesticides accounting for a comparatively minute share. However, growing environmental concerns regarding the use of synthetic pesticides that are primarily produced using petrochemical or inorganic raw materials have resulted in increasing demand for eco-friendly bio pesticides.